An Ardematic Automatic Mixing Station, connecting conveyor and Spraymation, Inc., programmed liquid dispensing system has reduced color shop labor from 6 to 3 men per shift at the Print Plant, Inc., in Winston-Salem, NC. With yearly labor costs near $26,000 per man, the annual savings (for a three-shift operation) approaches $234,000. One flat bed plus one combination (flat or rotary) printing machine have a combined production up to 200,000 yards per week. The average pattern has 12 to 14 screens with 100% coverage. To meet the plant's production demands, 60 mixes must be prepared on each shift. The standardized mixing quantity is 100 liters, but may decrease to 50 liters at certain times. Plant President Mr. Kelly Blanton says one primary reason they were able to improve their color shop operation and reduce labor costs was because they have, ". . . a good team of people working together . . . with foresight." Each color-shop shift has a supervisor and two men, one for each printing machine. The man puts clear into the drum, adds color by operating the liquid dispensing system, moves the drum along the conveyor, activates the automatic mixing and washing sequences, checks the mix, takes the mix to the printing machine, and checks the shading. Once the drum is brought to the mixing station by the conveyor, the entire operation is completely automatic. The start button is pressed. The mixer horizontally rotates 180 deg. from its washed position to the mixing position, then automatically lowers into the drum. The Reversible Homogenizer begins with the upward umbrella flow mixing followed by the downward vortex flow mix cycle and then another upward mix to assure complete dispersion with no dead spots or ingredients sticking to sidewalls. The mixer then rises out of the drum and rotates 180 deg. back to the "wash" station. In this position, the mixer is automatically lowered into the washing vessel. During the wash cycle, the homogenizer is automatically operated to flow wash water throughout the mixing head. As the mixer rises, it is subjected to multiple high velocity spray streams to assure total cleanliness. The mixer is then in its "ready" position for the next drum. The pneumatic sequences are time controlled and relayed to the master control panel through limit switches. The watertight main control panel includes: reversing starter, three mixing and one wash cycle timers, all sequence switches plus start and emergency stop buttons. The mixing cycle is two minutes or less and the mixers are cleaner, more uniform throughout the drum. The side walls and bottom have also been swept clean. 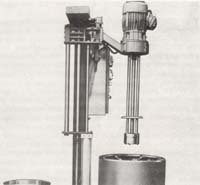 According to Blanton, the mixing system's success was due in part to the durability and reliability of the mixer and its reversibility, which proved invaluable." Since the mixer washing sequence is also completely automatic, the man uses this time to check his mix, bring acceptable print pastes to the print machines, etc. Even after doing all these steps, the time savings is great enough to allow the two men on each shift to make the clear. By operating the automatic mixing station in conjunction with the color dispensing system, Print Plant, Inc., has reportedly eliminated human errors from two critical functions; mixing and color dispensing. Kelly Blanton asked, "We never had a second because of mixing." Blanton has seen a reduction of people, labor, cleaner mixes, consistent mixing, shortened mixing time, and substantially reduced rotary screen print machine downtime. The print pastes now come to the print machine in much better condition as well. "All we have to do is to develop the cycle and go with it," is Blanton's conclusion.